Comfort and precision with reduced size. - Removable head for easy handling. - Semi-automatic for a comfortable use in the workshop. - Open-ended for wider belts. - No need to move the belt for triple punch. Steel made. Available for 600 up to 2200 mm wide belts. 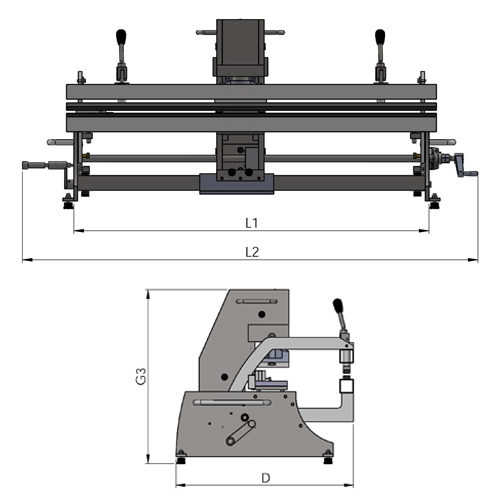 The punching machine incorporates hydraulic pressure system and is composed by the frame, the blade/knife, removable head and clamping system. Designed to use interchangeable blades/knifes and with different angles. Simple finger, finger over finger punching or triple punching. No need to move the belt for finger over finger and triple punching once the belt is fixed, thanks to an easy adjustment. Fonmar offers the following standard dimensions for the blades: 50x20, 80x12. Others upon request. Head operated by hydraulic cylinder. Supply of the pressure by means of: manual hydraulic pump or Hydropneumatic foot pump (Enerpac). 140x100mm nylon plate. Fastening the belt by means of a built-in clamping system. Top quality blades. Pointed shape and embedded in wood board for the preparation of the belt. Hydro-pneumatic pump for the supply of pressure. Manual pressure pump for the supply of oil to the hydraulic cylinder.